Mother's Day is right around the corner and this dessert would be the perfect thing to make for any mother in your life, or anyone really. I saw this dessert in the most recent issue of Bon Appetit and it practically jumped off the page. The bright red rhubarb and raspberries with a partially whole wheat crust. So rustic and beautiful.
. I threw together the crust the night before and in the morning it didn't take me long to prepare the filling and bake these little guys up. I made circles with my dough, although the circles were not perfect, as you can tell by the ragged crust in these pictures, and made sure to leave the 1 1/2-inch border, so there would be enough crust to fold over the filling. The crostadas baked up beautifully and made the perfect gift. I had a little bit of filling leftover and it was very good. This was a great treat for May. 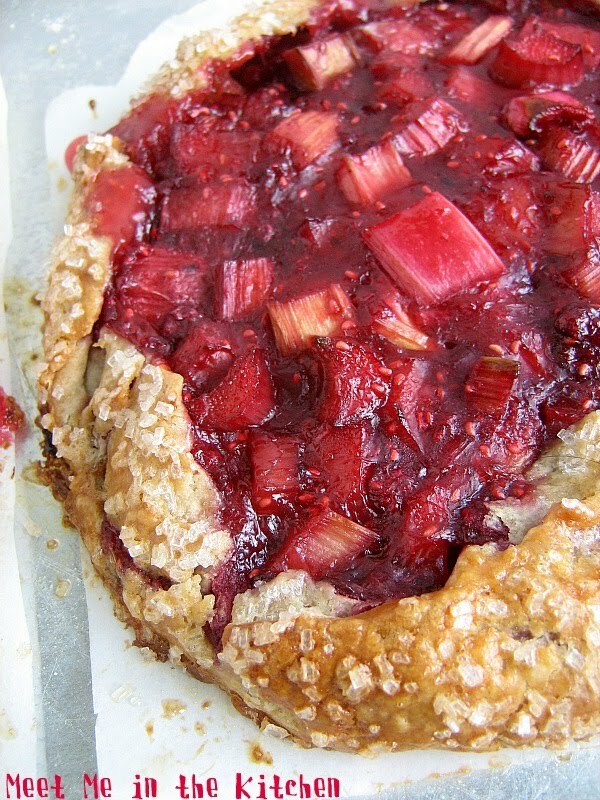 I love crostatas, and this one looks particularly enticing! That ruby red fruit oozing out...perfection. What a beautiful crostada, I love the rustic look of them and this looks SO delicious. I just found you from Aggie's Kitchen and I'm really happy I did. I just signed up to be a follower! It looks delicious! Can't wait to have some rhubarb this spring. I will freeze some rhubarb just for when the raspberries are ripe! Waiting for the rhubarb to flourish. Looks good and so delicious. 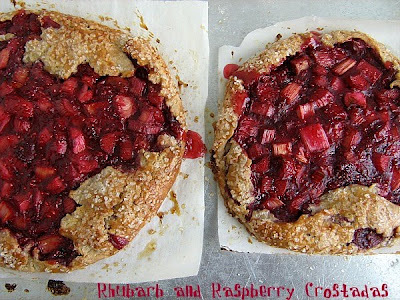 Just love the combo of raspberries with rhubarb. My rhubarb is ripe and ready to pick, so this sounds like a crostada calling me!